Charlot Barker (left) receives the Department of Defense Patriot Award from retired Pennsylvania National Guard Col. Patrick Heron (right). DOWNINGTOWN – One of the best ways to help men and women in the military is to support them in the workplace, and the Chester County Intermediate Unit (CCIU) is doing its part. 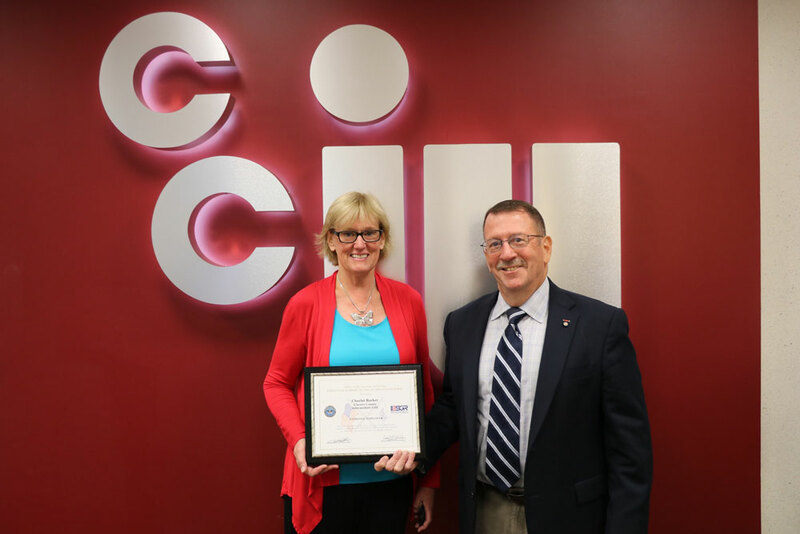 Two supervisors from the CCIU recently received the Patriot Award in recognition of their outstanding support for staff members currently serving in the military. Charlot Barker, director of technology support at the CCIU, and Dr. Susan Mateka, principal of the Child & Career Development Center (CCDC), were both honored with this prestigious award. The Patriot Award is presented by the Department of Defense as part of its Employer Support of the Guard and Reserve program. Service members have the opportunity to nominate a supervisor based on a wide-range of measures including: flexible schedules, time off prior to and after deployment, caring for families, and granting leaves of absence if needed. Service members must submit an application and include an essay explaining why the nominated supervisor is deserving of the award. Dr. Susan Mateka (center) receives the Department of Defense Patriot Award from retired Pennsylvania National Guard Col. Patrick Heron (right). Mateka was nominated by CCDC behavior mentor Nate Ashbaugh (left). “Receiving the Patriot Award is an amazing honor, I am extremely humbled and proud to be recognized,” said Barker. Barker was nominated by Steven Visco, who is a technology support specialist at the CCIU. Visco has been at the CCIU for two years and nominated Barker for her support as he balances work, the military and his family. 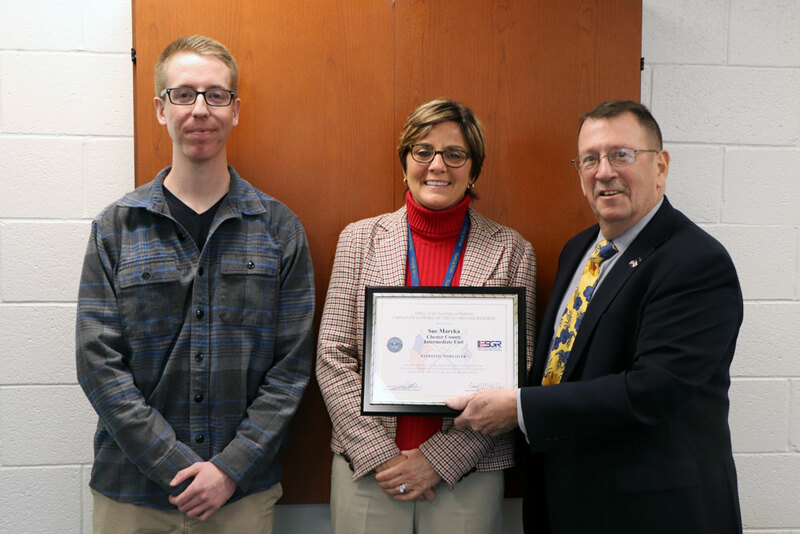 Dr. Mateka echoed Barker’s sentiments saying, “It feels good to support an employee serving our country.” Dr. Mateka was nominated by Nate Ashbaugh, a behavior mentor at the CCDC. “Nate is an outstanding employee, and I’m glad he knows we support him. He and others serving our country are the ones who deserve the recognition,” she added. Retired Pennsylvania National Guard Col. Patrick Heron, who served in the military for 34 years, and retired Command Sgt. Maj. Robert Curran, who served in the military for 36 years, presented Barker and Mateka with their awards. According to Heron, the Patriot Award recognizes the vital role that supervisors play in helping military veterans serve their country. “We have trained thousands of soldiers and one of the things we always emphasize is that soldiers need to balance the military, family and work. Having employer support through their basic training, service and possible deployment is vital to maintaining this balance. I love presenting this award because I believe that these recipients really make a difference for our troops and that carries great personal meaning for me,” said Heron. Curran believed that the Patriot Award reveals a lot about the culture in an organization. “These recipients and their teams are caring for these soldiers and that means a lot. It says a lot about their character that they make sacrifices to help their colleagues serve our country,” said Curran. For more information about the Patriot Award, please visit https://www.esgr.mil/Employer-Awards/Patriot-Award.